Spot cotton quotations were 169 points higher than the previous week, according to the USDA, Agricultural Marketing Service’s Cotton and Tobacco Program. Quotations for the base quality of cotton (color 41, leaf 4, staple 34, mike 35-36 and 43-49, strength 27.0-28.9, uniformity 81.0-81.9) in the seven designated markets averaged 63.49 cents per pound for the week ended Thursday, June 9, 2016. This was the highest weekly average since August 20, 2015, when the average was 64.11 cents. The weekly average was up from 61.80 cents last week, and 62.55 cents reported the corresponding period a year ago. Daily average quotations ranged from a low of 62.12 cents Friday, June 3 to a high of 64.07 cents Tuesday, June 7. Spot transactions reported in the Daily Spot Cotton Quotations for the week ended June 9 totaled 4,805 bales. This compares to 6,217 bales reported last week and 4,902 spot transactions reported the corresponding week a year ago. Total spot transactions for the season were 1,458,346 bales compared to 2,077,662 bales the corresponding week a year ago. The ICE July settlement prices ended the week at 64.96 cents, compared to 62.87 cents last week. The Department of Agriculture’s Commodity Credit Corporation announced a special import quota for upland cotton that permits importation of a quantity of upland cotton equal to one week’s domestic mill use. The quota will be established on June 16, 2016, allowing importation of 14,671,661 kilograms (67,386 bales) of upland cotton. Quota number 18 will be established as of June 16, 2016, and will apply to upland cotton purchased not later than September 13, 2016, and entered into the U.S. not later than December 12, 2016. The quota is equivalent to one week’s consumption of cotton by domestic mills at the seasonally-adjusted average rate for the period February 2016 through April 2016, the most recent three months for which data are available. Spot cotton trading was inactive. Supplies were light. Demand was light. Average local spot prices were higher. Trading of CCC-loan equities was inactive. Tropical storm Colin made landfall across the Big Bend of Florida late June 6 and tracked across coastal Georgia and the Carolinas in the period. Heavy rainfall and maximum sustained winds of 50 mph damaged buildings and downed trees and power lines in areas along the Gulf Coast. Portions of the panhandle of Florida received in excess of 6 inches of heavy moisture early in the period. Areas from central Georgia to Virginia received 1 to 2 inches of accumulated moisture as the storm tracked along the Atlantic coast. Mostly sunny conditions prevailed across the entire region late in the period with daytime high temperatures in the upper 80s to upper 90s. The ideal weather allowed fieldwork to continue across the region where soils were firm enough to support equipment; planting activity should rapidly near completion in most areas in the next week. Local experts reported some replanting will be necessary in low-lying areas of the Carolinas due to water standing in fields for several days. Producers scouted fields and treated young plants for thrips across the region, but the rainfall had reduced their numbers in some areas. Plant bugs were detected in some fields in Georgia, in addition, weed control measures were ongoing. According to the National Agricultural Statistics Service (NASS) Crop Progress report for the week ending June 5, cotton squaring had reached 10 percent in Georgia, 8 in Virginia, 3 in Alabama, 2 in North Carolina, and 1 percent in South Carolina. NASS reported the crop as mostly good in Virginia and mostly fair-to-good in the rest of the Southeastern region. Spot cotton trading was inactive. Supplies of available cotton were light. Demand was light. Average local spot prices were higher. Trading of CCC-loan equities was inactive. No forward contracting was reported. Rain showers early in the period gave way to clear skies over the region for the remainder of the reporting period. Up to 3 inches of precipitation was recorded in a few isolated areas. Daytime temperatures were in the 80s and 90s. Overnight lows were in the 60s. Local experts reported that the stage of growth varied widely, from barely emerged up to 5-6 leaves, due to non-uniform moisture conditions across the region. The sunny weather helped saturated soils to firm enough to allow equipment to get back in the fields. Producers were struggling with weed problems in a few fields. Light pressure from plant bugs was reported; control measures were expected to begin in the next few days. The crop made good progress under favorable conditions. According to the National Agricultural Statistics Service (NASS) Crop Progress report for the week ending June 5, cotton squaring was reported to have reached 3 percent in Arkansas, Missouri, and Tennessee. NASS also reported that the crop was in fair-to-good condition. Spot cotton trading was inactive. Supplies of available cotton were light. Demand was light. Average local spot prices were higher. Trading of CCC-loan equities was inactive. No forward contracting was reported. Sunny weather prevailed over the region during the reporting period. Daytime temperatures were in the 80s and 90s. Overnight lows were in the 60s. The dry weather helped firm saturated soils, particularly in low-lying areas that experienced flooding due to heavy rainfall in recent weeks. Local experts reported that the stage of growth varied widely from field to field due to erratic moisture conditions. In some cases, the variability in crop development, from cotyledon to initial squaring, was seen in the same field. The sunny weather helped dry saturated soils enough to support equipment. Layby was underway in the earliest planted fields. Producers were battling weed problems in some fields, using both mechanical and chemical methods. Fields were also treated for plant bugs and thrips, as necessary. The crop made good progress under favorable conditions. According to the National Agricultural Statistics Service (NASS) Crop Progress report for the week ending June 5, cotton squaring was reported to have reached 8 percent in Louisiana and 3 percent in Mississippi. NASS also reported that the crop was in fair-to-good condition. Spot cotton trading was slow. Supplies, producer offerings, and demand were light. Average local spot prices were higher. Trading of CCC-loan equities was inactive. Foreign mill inquiries were light. Interest was best from India, Mexico, and Taiwan. 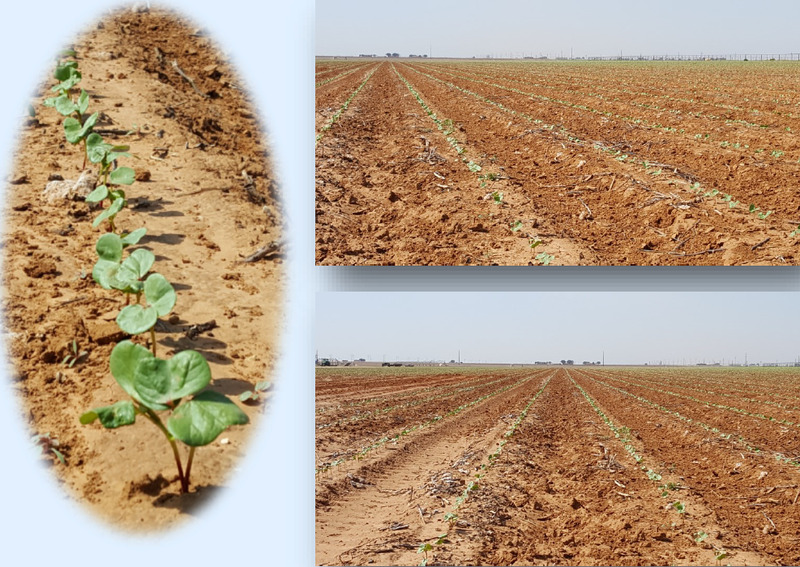 Cotton fields in the Coastal Bend advanced and overcame struggles from saturated field conditions. Herbicides and insecticides were aggressively applied to manage populations by ground spray rigs, if fields were able to support equipment. Some saturated fields were treated through aerial applications. Stands in southern Texas and the Rio Grande Valley advanced, and plant growth regulators were applied to control growth after recent rainfall. In eastern Texas, rainfall early in the reporting period damaged some stands, but warmer, drier conditions prevailed and the stands gained vigor. Spraying was active for weed populations that had exploded following recent rainfall. Treatments were applied for thrips and fleahoppers. In Kansas and Oklahoma, planting was extremely active. Some replanting was underway. Thrips were moving from wheat fields to early cotton; therefore, insecticides were applied in some areas. Cotyledons and seedlings responded well to warmer weather. Spot cotton trading was slow. Supplies, producer offerings, and demand were light. Average local spot prices were higher. Trading of CCC-loan equities was slow. Foreign mill inquiries were light. Interest was best from India, Mexico, and Taiwan. Industry experts reported that planting in the panhandle was completed and some stands struggled to establish under recent rainy weather. Seedling disease and chill injury was reported in the northern counties as a result of cool, wet weather in May. Local industry members indicated that approximately 65 to 70 percent of acres were planted in the Southern High Plains by Friday, June 3. The percentage of planted acres increased significantly by Sunday, June 5, which was the final plant date for full crop insurance coverage for Hale, Hockley, Yoakum, Floyd, Lubbock, Terry, Cochran, Crosby, and Gaines Counties. Sunny conditions helped the soils to firm enough to support equipment and planting was active during the weekend. Temperatures were in the upper 80s to low 90s. Seeds quickly germinated and cotyledons emerged, due to good topsoil moisture levels and building heat units. Intermittent thunderstorms were in the area depositing less than three-fourths of an inch of additional moisture. Reports indicated that stands planted on May 20 had advanced to four true leaves. Thrips populations were under threshold levels, but with optimal conditions encouraging transitions from wheat to cotton fields, careful monitoring was underway. The sugarcane aphid pushed some acres from milo to cotton. Spraying for weeds was active. Producers targeted Palmer amaranth (pigweed) and marestail to limit noxious weed seed production. Fields were saturated in the Southern Low Plains and Edwards Plateau; therefore, planting was limited. Spot cotton trading was inactive. Supplies and demand were light. Average local prices were higher. Producers inquired for 2016-crop contracts. No forward contracting or domestic mill activity was reported. Foreign mill inquiries were light. Temperatures were in the high 100s to mid-110s in western and central Arizona. The crop suffered under a couple of days of heat stress. Compared to last year, the first heat stress days were recorded in July. The early February plantings approached peak bloom with 1 inch bolls in Yuma, Arizona. Later-plantings were at first flower. No insect pressure was reported, but local experts noted Texas root rot was present in some fields. Field activity was active with irrigations, herbicide applications, and in some areas applying plant-growth regulators. Temperatures warmed into the high 90s to low 100s in New Mexico and El Paso, Texas. Hot, dry conditions advanced the crop. Local experts reported an increase in weed populations and producers are spraying herbicides. Testing is underway to determine the cause of wilt in some fields. It was noted that the wilt was not widespread. Spot cotton trading was inactive. Supplies and demand were light. Average local prices were higher. No forward contracting or domestic mill activity was reported. Foreign mill inquiries were light. Temperatures were in the low 100s, which was about 10-12 degrees above normal. Nighttime temperatures were in the high 60s to low 70s, which provided relief to cotton plants. Cotton fields were irrigated. Some producers had crews walking fields and hand hoeing weeds in western Fresno County. The crop made good progress throughout the Valley. Spot cotton trading was inactive. Supplies of 2014-crop were moderate, but light for 2015-crop. Demand was light. Average local prices were steady. No forward contracting or domestic mill activity was reported. Moderate hot, dry conditions advanced the crop in the far west. The crop was 7 to 10 days ahead of schedule in Yuma, Arizona. Sources reported first bolls in the earliest-planted fields. Heat stress was a factor early in the period for Arizona and California as temperatures spiked into the mid-to-high 100s. The crop made good progress in California, New Mexico, and El Paso, Texas. Local experts reported increase weed competition and some plant wilt in New Mexico. Fieldwork activity included irrigating fields, applying herbicides, cultivating, or had work crews hoeing weeds. Domestic mill buyers inquired for a moderate volume of 2016-crop cotton, mostly color 41, leaf 4, and staple 34 and longer for October 2016 through March 2017 delivery. No sales were reported. Most mills have covered their immediate to nearby raw cotton needs; lackluster finished product business had caused a few mills to cancel or delay delivery of previously purchased raw cotton to manage inventories. The undertone from most mill buyers was cautiously steady. Most mills operated four to seven days. Demand through export channels was moderate. Agents throughout the Far East inquired for any discounted or low-grade styles of cotton. Regional Price Information Southeastern Markets A light volume of color 41, 42, and 52, leaf 3 and 4, staple 35 and 36, mike 43-52, strength 26-29, and uniformity 81-83 sold for around 60.00 cents per pound, FOB car/truck, Georgia terms (Rule 5, compression charges paid, 30 days free storage). In Oklahoma, a light volume of color 31 and 41, leaf 3 and 4, staple 35, mike 38-41, strength 30-31, and uniformity 80-81 sold for around 60.00 cents per pound, FOB car/truck (compression charges not paid). A light volume of color 32, leaf 3, staple 34 and longer, mike 41-47, strength 29-31, and uniformity 78-82 sold for around 54.00 cents, same terms as above. In Texas, a light volume of 2014-crop cotton color 42 and longer, leaf mostly 3, staple 34 and longer, mike 47-53, strength 26-34, and uniformity 80-84 sold for around 49.00 cents, same terms as above. A moderate volume of color, mostly color 31 and 41, leaf 5 and better, staple 34, mike 35-49, strength 24-31, and uniformity 76-80 sold for around 59.25 cents per pound, FOB car/truck (compression charges not paid). Mixed lots containing a heavy volume of mostly color 42 and better, leaf 3 and 4, staple 31 and 32, mike 41-50, strength 25-30, uniformity 76-81, and 25 percent extraneous matter sold for around 57.00 cents, same terms as above. A light volume of mostly color 32 and better, leaf 3 and better, staple 33-35, mike 35-48, strength 27-31, and uniformity 78-83 sold for around 52.50 cents, same terms as above. A light volume of CCC-loan equities traded for 2.50 to 3.00 cents.